All Replies on New TS and need some input on a fence. New TS and need some input on a fence. I personally wouldn’t want an Accufence because you have to crank a knob to tighten it. The fence on the Delta is a light duty and cheaper made version of a Biesemeyer, the biggest downside I’ve read about is the split rail. Out of those 2 choices, I would choose the Delta just for ease of use. But really I would prefer a true Biesemeyer or find a used Unifence which in my opinion is the strongest and most versatile t-square saw fence ever built at the consumer level. I’ve had the Accufence almost 15 years. I love it. My four-foot shop-built table is on the right. I adjust it with shop-built turnbuckle-type supports – threaded rod inside electrical conduit kept in position with washers and nuts. The fence rails keep everything in place perfectly. 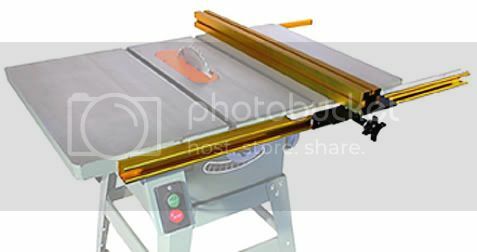 You are right – the rear rail prevents an outfeed table that is attached to the rear of the saw. So I built mine as a separate unit that folds up. I keep it out of the way when I don’t need it. Its top is in line with the bottom of the mitre slots. My TS is on a movable base so absolute precision – a 4 mm drop isn’t sinificant on long rips. Did you buy an “Accufence” or the Mule Cab “Accusquare”? They are two very difference designs. The Accufence is a good heavy duty welded steel Biese copy made by HTC, and is the stock fence on several PM saws. It’d be a nice upgrade from the Delta fence IMO, and almost all lower end stock fences. The Mule Cab Accusquare is lighter duty, is aluminum, and needs to be rolled all the way off the fence to remove it. The Mule does have some nice accessories that mount to the t-slots, but overall I prefer the steel t-square fences. The T3 is in a similar price range as the Accusquare. The T3 is a bit beefier than the Accusquare, is stiffer, easier to use, but doesn’t have the T-slots. The stock fence on the Delta is very similar other than it has the two-piece front rail. The hook on the back is there to prevent lifting, not to hold the back of the fence tight. Do you use the rear rail? Any concerns with not using it? Not looking to buy any fence. Only looking for thoughts between the two I have (or will have as soon as if gets delivered).